The Topcon RL-H4C Self-Leveling Rotary Laser 57177 is accurate 1/16 in. at 100 ft., a range of up to 2,600 ft. and leveling within 5°. Its slope matching feature makes it an excellent tool for excavating. This self-leveling laser rotates at 600 RPM in full gear. If it is knocked out of position, it automatically re-levels itself with an outstanding accuracy of +/-10 arc seconds in angular measurements. The included laser receiver extends the range of this level to its full working range. It is durable enough to withstand drops, and is both water and dust proof. The batteries provide up to 80 hours of continuous use and it automatically shuts off after 30 minutes of non-use. There is a low battery indicator, and an out-of level alert that works on the 2-way communication system. It has fine and normal accuracy options, and 2 LCD displays one on the front, the other on the rear. Plus it comes with batteries and a rod clamp. Topcons RL-H4C has convenient features like slope matching and high speed rotations. The new dual handle design makes this horizontal level easy to maneuver. This rugged construction laser has dry D batteries that provide up to 100 hours of use. It is also weather-resist, being both dust-proof and resistant to water jets. The Topcon rotary laser also comes with a battery holder, a carrying case, user manual, and a 5 year limited warranty. Laser product below 5mW and class II. Tbook.com crawls the web to find the best prices and availability on Levels and related Tools and Hardware products like Topcon RL-H4C Rotary Laser Level. For this page, related items include products we find that match the following keywords: "Level" at our vendor partner Home Depot. 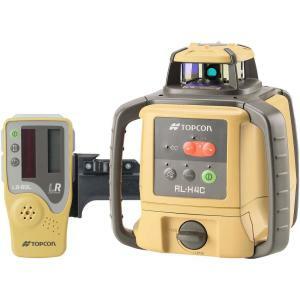 Topcon RL-H4C Rotary Laser Level is one of 154 Levels and related products listed in the Tools and Hardware section of Tbook.com If you have any questions on this product, please give us a call at 734-971-1210 during the hours of 9am - 5pm EST for assistance. Thank you for shopping at Tbook.com, the Internet Department Store!